On October 6, 2018 we held the Adventures in Agile workshop at our office in Prague. What was significant about this workshop was the demographic of the attendees. The room was full of women wanting to learn how to apply Agile values and principles both at work and in their everyday life. We organized the workshop in partnership with Czechitas, a non-profit organization, held by a community of IT coaches, course alumni, and professionals focused on fostering diversity and building female talent in IT teams in the Czech Republic. Czechitas supports females “to find their way” in developing their professional career in technology through many initiatives. They create courses on programming, web development, graphic design and data analytics, they organize meet ups and workshops to build a network of professionals and where people can work on real projects. What captured our attention about Czechitas is that they assist young women starting from the education and the beginning of their career, helping them to choose their field of study and guiding them towards specific technologies. They also connect them with professionals in the field they choose, and they stay in touch to provide coaching and mentoring programs during their career path. Although only around 20% of tech jobs in EU are held by women, the number of females entering this field in a variety of areas is increasing and there is still plenty of work to do to change the perception of girls in tech in different levels of the education system. Petra Balášová, Workshop Coordinator and Volunteer at Czechitas explains that women are entering in IT from other fields all the time. Apparently at first, they don’t think they’ll like it and they are starting from the wrong perception but once they explore what IT has to offer, they quickly find success. And workshops like the one we delivered with Czechitas offer them a safe environment where they can discover their potential in this field. The Adventures in Agile workshop was a one day event, delivered by our “Vistaprinters” Daryl Paraguya and David Reichert where the attendees learnt the basics of the Agile framework through interactive sessions and games. The day gave attendees a hands-on experience of how to apply Agile values to real problems both in work and everyday life and it also offered an open environment where they had the opportunity to raise their voice and share ideas and thoughts. 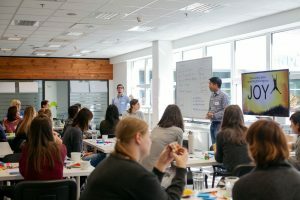 The workshop gave us the opportunity to train twenty-four women in Prague on Agile values and principle and the same time their experience with us brought them closer together as a community in the technology world. We truly believe that the partnership with Czechitas has been a great success and we look forward to working together on the next project!